Everyone loves a good love story, and when it involves travel it’s even better. This guest post from Stephanie Yoder explains why. And how. Keystone in June will be my third time at TBEX. I’m becoming quite the veteran. I’m sure it will be an awesome event, as it was last year in Vancouver, but the truth is that neither of them could ever live up to my favorite TBEX. That’s because my first year, in New York, is when I met Michael. They always say meeting the right guy will happen when you least suspect it, but in my case it was more like “it will happen when you’ve already definitely decided it’s not going to, not for few years at least, stop bugging me everybody.” I was planning to quit my job and travel around Asia, my travel blog was picking up in popularity and boys were absolutely the last thing on my mind. In true blogger fashion, it all started on Twitter. While procrastinating one day I started chatting about travel budgets with some guy who had a blog called Art of Backpacking. After some playful back and forth banter (Twitter flirting? Is that a thing?) he sent me a Facebook friend request. “Wow, that guy is actually pretty cute,” I commented to a friend before promptly putting it out of my mind. 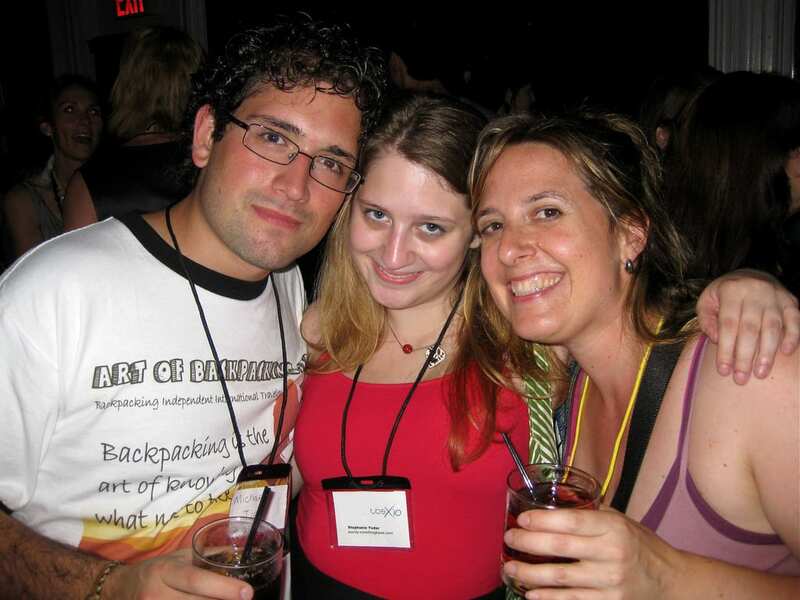 This was a couple of weeks before TBEX 2010 in New York City. It was to be my first major professional event and I was extremely intimidated at the idea of being around so many people that I felt connected to yet had never actually met. In a few darker moments of doubt I considered not going, but by the time I arrived and was sipping cocktails at the Thursday night PRE-BEX event I was glad I’d braved it. Everyone was so nice and so friendly. That evening, at an Irish bar in Midtown, I finally met the cute boy from Twitter. He was tall with a mess of curly hair and really cute glasses (I have a weakness for glasses). He greeted me with a huge smile and a hug. Then he bought me a beer. And that was that. By the end of the weekend we were inseparable. The stars weren’t perfectly aligned: He was headed to China to teach English for a year, and I had my own travel plans but it didn’t seem to matter. I just wanted to be close to this guy. The very next weekend he came down to DC to see me. Shortly after that I changed my flight itinerary to pay him a visit in Xi’an. That was two years ago. Two years of traipsing around China, Thailand, Colombia and more with my new favorite travel companion. We’ve been white water rafting in Ecuador, wine tasting in Argentina and eaten our way through Vietnam. We share a love of exploring new places, meeting new people and the endless possibilities that travel brings. And eating, we both really, really love eating. Sometimes I joke that I’m only dating Michael for the tech support, but in truth dating another travel blogger has all kinds of awesome perks. He helps me when my site goes down and I proofread his articles. We both understand the crucial importance of free wifi and that all food must be photographed before eating. We look at new sights with two different perspectives and our work often overlaps in fun ways. We inspire each other. I will admit that sometimes it feels a bit nerdy to tell people that we met “at a travel blogger convention.” Everyone loves it though, and as a result TBEX will always hold a special place in our hearts. We’ve both made so many great friends and connections via the conference and learned so many things. Through TBEX we haven’t just found each other, we’ve found a true support community. Plus, it makes it hard to forget our anniversary! Stephanie Yoder is a girl who can’t sit still! 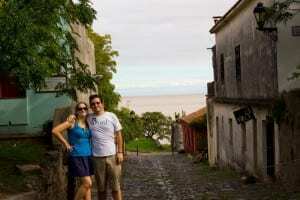 She writes about Generation Y Travel on her website Twenty-Something Travel and tweets @20sTravel. She is speaking at TBEX Keystone. I already knew this story, but I read it again anyway. I’m so glad I got to hang out with you both in BA and I cannot wait to see you for my very first TBEX in June! I ADORE this love story!! Thanks so much for sharing it. I love your story! And it’s so similar to mine. I had totally moved on from wanting to meet a guy when Andy and I started talking on twitter, me in Atlanta, him in Germany. Falling in love through twitter, email and Skype over 4 months before meeting in person was not how I ever expected to meet the man I’d marry. We joke that TBEX Vancouver was our honeymoon because it was a week after our wedding. Having a travel partner is great, and even better that we both understand the blogging stuff. And yes, Andy’s tech internet tech skills are a huge plus, I’m with you on that one! Your story is one of my favorites as well Ali! Great story! I guess there’s hope for me yet! Glad to hear about your first experience at TBEX. I’m considering goin to TBEX in June as well. It will be my first, but am going back and forth about it. Some fear and nervousness but I know it would be a great new step. Any tips on going to TBEX for the first time? Well, the most useful part of TBEX is definitely the networking, so come prepared with a ton of business cards, and perhaps a list of people you want to connect with. Things can be a bit overwhelming but if you have a good idea of what you want to get out of the experience, it should go smoothly. Hope you make it, it’s really inspiring! Hehe… love this story =) I totally get the weakness for glasses… on the right face, they’re sooo cute! I have to admit I hadn’t follow closely enough to put 2 and 2 together. I knew you were dating Michael and you were traveling around together but I had no idea it was Art of Backpacking. That’s a great story! Aww, great story! Must be brilliant dating a travel blogger – all those ‘research’ holidays together and always having your best friend by your side. Love it! Such a great story Steph! I know they’re doing speed dating for the potential blogger/sponsor relationships but perhaps they should start an actual speed dating event for those of us still looking for our love story! =) Congratulations and hope to meet you both at TBEX! This is just too cute. I am so looking forward to my first Tbex next month and hearing you speak! Stephanie- great story. You almost always find the perfect mate when you start looking. Steve and I met 39 years ago- we’d both had stopped looking and it was love at first sight. We both had our own plans to, but, it all worked out and we;re still traveling together after all these years. Kismet! Such a cute story. Loving that I hear there are more and more people like me who photograph their food before eating it…it’s like travel blogger etiquette. Auw, so sweet. I’m still hoping to find someone who shares the same interest, that is travel. Cheers to many years to go. Maybe twitter flirting should be called twirting, or flittering – just don’t call it fleeting. It’s an adorable story – and you wrote it well. Congrats you two! Very happy for you both! Well guys, I proposed!! and she said yes! !